She’s calling it “United States of Pizza: Women’s Slice of the Pie.” Every week the restaurant will offer up a cheesy, saucy concoction inspired by female politicians. This week it’s the women of Washington state, including an all-female Senate delegation — one of just six in the nation. Maria Cantwell and Patty Murray, meet cheddar and thyme. 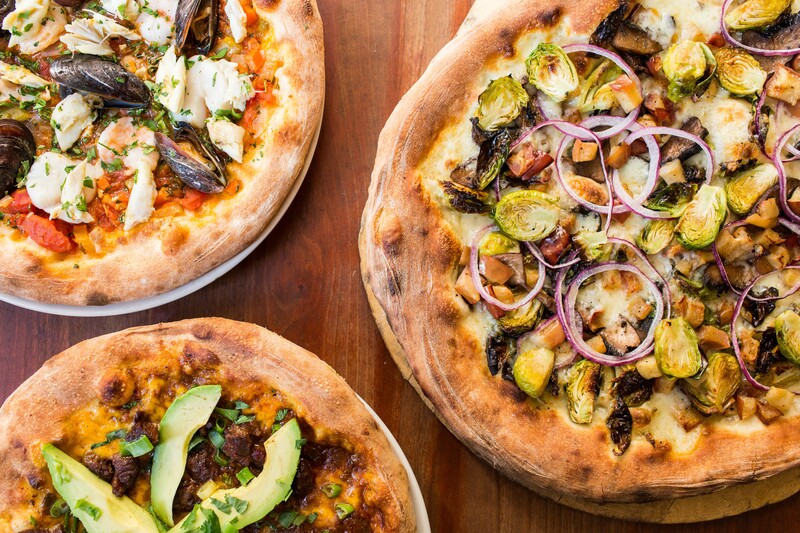 The “apple orchard pizza” is piled high with brussels sprouts, portabella mushrooms, red onion and, yes, apples. It’s all on Paradiso’s signature wood-fired crust, which means a smoky flavor and a satisfying crunch. From her three decades as a chef, Gresser knows a little something about breaking into a male-dominated industry. And it’s not the first time she’s marked women’s gains with a pizza salute. In the lead-up to the midterm elections, she made a New York-style pizza in honor of Alexandria Ocasio-Cortez, now the youngest person in Congress. The idea was to celebrate female “firsts,” which also meant a hominy and queso pie for Kyrsten Sinema, who went on to seal her place as the first bisexual senator. That’s why she decided to keep things rolling in 2019. While all the politicians featured in her election-season special were Democrats (that’s just the way it worked out, she said), the new promotion is bipartisan. If your state has women in Congress, the governor’s mansion or other high office, she’ll be dreaming up a pizza for it. For California, think shrimp, mussels, tomatoes, onion and peppers. It’s modeled after Cioppino, a fish stew developed by Italian immigrants in San Francisco — which seems a fitting tribute to Nancy Pelosi and the district that’s sent her to the House a total of 17 times. It used to be that Kay Granger, Sheila Jackson Lee and Eddie Bernice Johnson were the only Texan women in the House. Theirs was a lonely trio for more than two decades, but now their number has doubled — which calls for some chili-braised beef, orange cheddar cheese, scallions and cilantro with avocado. Gresser first created the pie in honor of Gina Ortiz Jones, who would have been the first Filipina-American in Congress. She may have lost in the Lone Star State, but three other newcomers won: Sylvia R. Garcia, Veronica Escobar and Lizzie Fletcher. Last time Gresser donated $1,000 of the proceeds to the League of Women Voters, an organization that was important to her mother. This time she hasn’t picked a charity, but she has mulled raising funds through a tasting party — which could involve convincing lawmakers to come and sample themselves in pizza form. For the record, there are 11 other states without a single woman in Congress, up one from last year. Those would be Arkansas, Idaho, Louisiana, Montana, North Dakota, Utah, Kentucky, South Carolina, Vermont, South Dakota and Rhode Island — though the latter two have female governors. Maybe Gresser’s promotion will give them an incentive. No women? No pizza. Pizzeria Paradiso has locations in Dupont Circle, Georgetown, Old Town, Hyattsville and Spring Valley. The political pizza special — $15 for a 9-inch and $20 for a 12-inch — will rotate throughout the year.